Barbara Glover, known to her friends as “Bobbie, felt as she approached her 70th birthday a desire to find out about her missing three years of childhood. 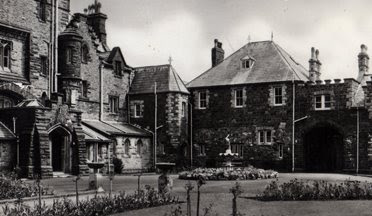 All she knew was that she had spent it in a Welsh sanatorium a place she was put as a three year old in 1943 with TB of the bones and she was to remain there until 1946. “My one big memory was of American soldiers marching past and throwing sweets on to our beds which had been wheeled out for the fresh air. “But my parents never talked about my time there. After they died I went through their papers hoping to find some clues. There was nothing,” said “Bobbie”, speaking to me on the phone from her home in Peterborough. The eldest of 9 children her Irish parents had emigrated to Birmingham in the late 1930’s. But she had no idea why she ended up in a Welsh hospital “ unless we had been evacuated there during the war”. Another big memory is the day she left. She typed TB sanatorium Wales into Google and up popped the “Children of Craig-y-nos” blog. “Bobbie” is thrilled to discover her missing past and I have given her the names of people who were there at the same time as her. She now plans to visit Craig-y-nos. Looking back over her own life she says it has “had its ups and downs”. “I married at 18 and my first husband died of cancer when I was 26 leaving me with two young children. Five years later I met another man who wanted more children. The story has a happy ending though for Bobbie met another man and they have been happily married for twenty years. And so the story of “The Children of Craig-y-nos” continues…. *The Glass Conservatory has recently been refurbished into a function room for the Castle which specialises in weddings and ghost tours.